His latest musical project is the group White, a vehicle for cutting-edge, progressive modern music performed with a world-class band. Vocalist Robyn Dawn provides soulful, touching vocals; Steve Boyce holds down the bottom end with a dance-inducing groove and soaring vocal support; Karl Haug truly is a master guitarist, equally comfortable on delicate acoustic, driving electric and searing electric laptop slide; Jonathan Sindelman, ties the resulting soundscape together with punchy keyboard work, exhilarating orchestrations, and scorching solos. Steeped in sonic variety, White evokes an emotional response from its audience, and is certain to build a strong word-of-mouth buzz. 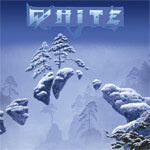 The band's debut album, White, was released in 2006 and is available in both the US and Europe. Download two full songs for free, listen to samples, then buy the album. Group Photo © Jerry & Lois Photography. Used by Permission.